Now that some air has been taken out of gold and silver, I'm SLOWLY (key word) rebuilding these positions. With some purchases late Friday and this morning I am back from a 0.2% allocation (combined) to something around 1.4%. 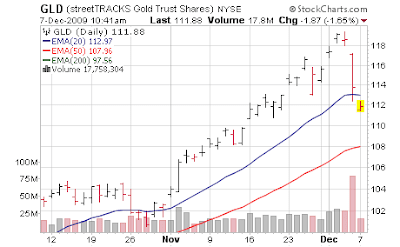 (recall we essentially sold all our holding except for a holding stake a week ago, Wednesday right ahead of Dubai) I would love to see a 4-8 week correction in precious metals, at which point I'd build a quite material position but you never know in advance if we are headed for such an event, or a 2 day blip. My main worry is this trade is so crowded with hedge funds, that if it truly reverses it will have nothing to do with fundamentals and everything to do with lemmings jumping off a cliff. Hence dip buying of this type is fraught with risk, but there is nothing in US economic policy that argues against weak dollar/strong precious metals in the long run. I am not owning these items as an inflation hedge, but protection from Ben Bernanke's war on fiat money. Frankly even when the US goes back to "normal" times I don't see a country able to live without cheap money since we're all addicted to it, so we could be talking half a decade before interest rates go back to anything near "normal" unless the bond market exacts its own will on Ben. And if it does, we're really in trouble. So while the lemmings will jump off the cliff as they anticipate some rate hikes from 0-0.25% to ? 1%? 1.5%? it will be humorous in many ways. 1% used to be considered extraordinary low rates, and we're going to panic because Ben raises rates to levels that Alan caused massive bubbles with? So as we look out multiple years, expect dollar 'strength' as we return to (again it's laughable) "high rates" of 1-2%. And then if the US economy is so structurally impaired as I believe, we're going to be stuck at some low level of rates for a very long time, with constant stimuli / state bailouts / cash for (insert whatever you wish) programs et al - all of which are killing the dollar (living standard of Americans). But there might be 6 month periods in between these long term trends where the dollar has counter trend rallies and lemmings jump off cliffs. When these occur will be anyone's guess and being flexible is the key. 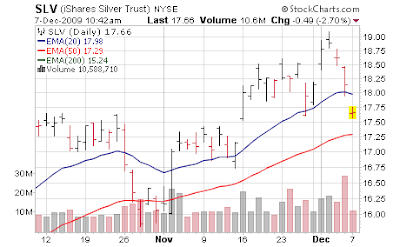 I've added to Ultra Silver (ACQ) and Powershares DB Gold Double Long (DGP) - slowly - with all the caveats listed above. Every 4-6% down, I'll probably add another medium sized batch.